Maybe free standing or rack mounted in a 1U rack. Powered from 5 - 12 volts. Re clocking to minimize jitter. 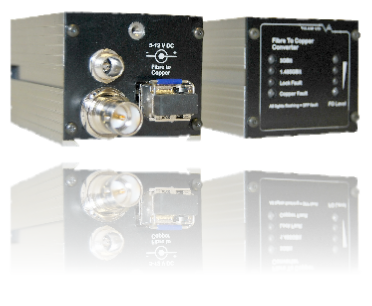 The video fibre optic receiver is a high speed digital fibre optic receiver which, when used in conjunction with our video fibre optic transmitter, will allow the extension of SDI / HDI links up to 4 Km. To achieve maximum distance the transmitter will launch into single mode fibre at a wavelength of 1310nm. The receiver will recieve1310nm and 1550nm wavelengths. Designed to support data rates of 143, 177, 270, 360, 540, 1483.5 Mbps and DVB-AST at 270Mbps, it has auto mode for data rate selection. The fibre optic input wavelength is between 1200 - 1600nm. Copper output is by a standard 75 Ohm BNC connector. 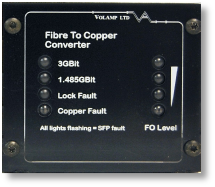 Front panel status indicators provide indication of receive fibre input level. Powered from a standard power cube or a rack mountable PSM. BNC output is 75 Ohms standard HD and SD serial digital signal. Note 3G/HD indicators are the type of SFP Inserted and not what is actually being used. BNC connectors protudes 20mm from the unit. 5-12v dc @2w, 2.1mm coaxial centre positive. Unit will connect to power a source in the rack frame. Power adaptor is available for free standing use. Distance achievable with suitable Transmitter. For further combinations please contact us.